Lee, W., Choi, H.M., Lee, J.Y., Kim, D.H., Honda, Y. and Kim, H. 2018. 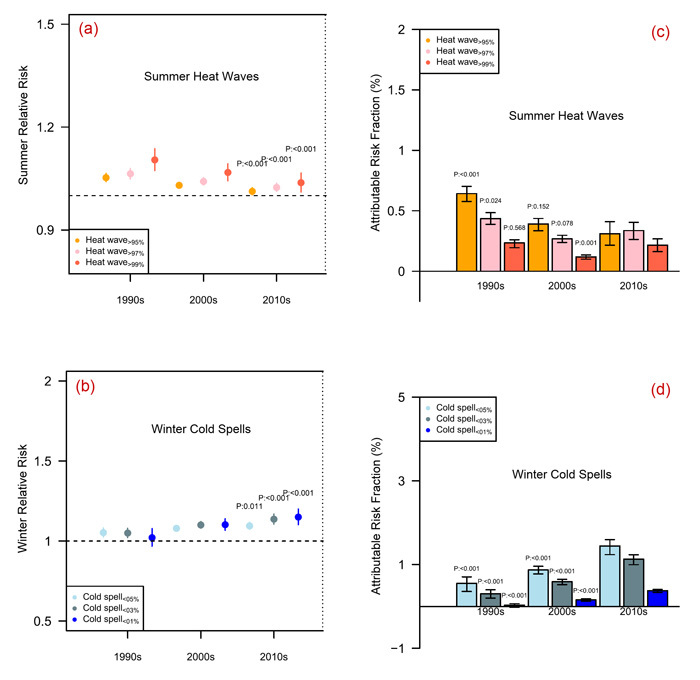 Temporal changes in mortality impacts of heat wave and cold spell in Korea and Japan. Environment International 116: 136-146. Most studies examining the impact of temperature on human mortality tend to focus solely on the effects of heat waves. Few are the studies that also examine the effects of cold waves and even fewer are the studies that investigate the temporal changes in the mortality burden attributed to both heat waves and cold spells over time, which is exactly what the research team of Lee et al. (2018) set out to do in their recently published paper. Writing in the journal Environment International, the six researchers describe how they collected and analyzed daily mean temperature and all-cause mortality data for 53 communities in Korea and Japan for the period 1992-2015. Using statistical procedures, they were able to derive decade-specific overall lag-cumulative relative risks (RR) of mortality due to heat waves and cold spells at their study locations, as well as to calculate the attributable number of deaths (ARF) caused by heat waves or cold spells across each decade: the 1990s (1992-1999), the 2000s (2000-2009) and the 2010s (2010-2015). Heat waves (cold spells) were defined as daily mean temperatures above (below) the 95th (5th), 97th (3rd) and 99th (1st) percentiles of the temperature distributions for two or more consecutive days for each community during the study period. As revealed in the figure below, results of their analysis, in the words of the authors, provide "evidence of temporal decreases in the RRs of heat waves for all intensities of heat waves in the total population" (Figure 1a). In contrast, the RRs of all cold spells significantly increased across the study period (Figure 1b). Similar to the findings of RRs, the ARFs decreased for heat waves and increased for cold spells from the decade of the 1990s to the decade of 2010 (Figure 1c and 1d). In commenting on their findings, Lee et al. say that the observed mortality decline from heat waves "can be interpreted as an adaptation," where the populations of the two countries have become less-susceptible to the negative impacts of heat in recent years. Unfortunately, their results also indicate that the same population has "maladapted to cold spells during recent decades." Consequently, it would appear from this study that societies should be a lot more concerned about the negative health impacts of cold spells than heat waves; for humans appear to be much more capable of adapting to heat waves, thereby reducing their possible risk of mortality, than they are of cold spells. Figure 1. Temporal changes in cumulative relative risks of (a) heat waves and (b) cold spells on mortality by decade in the total population of 53 communities in Korea and Japan, as well as the attributable risk fraction of mortality due to (c) heat waves and (d) cold spells over the same period. Adapted from Lee et al. (2018).